Okonomiyaki, sometimes affectionately referred to as "Japanese pizza," is eaten as a light meal and is something like a pancake cooked on top of a hot griddle. The base is made from wheat flour and water, and it has chopped veggies and meat and so on mixed in. 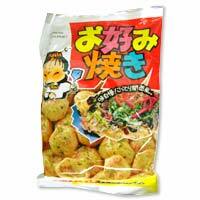 If you like okonomiyaki, you will love this snack.